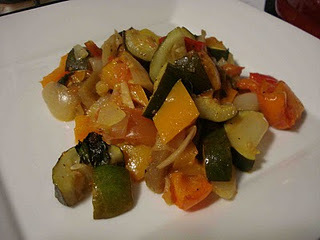 Joel made this ratatouille last night, again from the Moosewood Restaurant Simple Suppers cookbook. I feel like this recipe is similar to several other things I have made in the past, but I guess it's just because this is the combination of vegetables that we like the best. It made a lot, so we ended up with leftovers, which is perfect for lunches! Cut all of the vegetables into 1-inch chunks and place them in a large bowl. You need between 12-14 cups total. Coarsely chop the garlic. Toss the vegetables and garlic with the olive oil, salt, and pepper and spread onto a baking sheet (or 2). Roast the vegetables in an oven set to 450 degrees for about 15 minutes, then stir. Continue to roast for 25-30 more minutes, until the vegetables are fork-tender and juicy. While the vegetables roast, chop the basil. When the vegetables are done, put them in a serving bowl and stir in the chopped basil. Garnish with Parmesan.